Because obligatory acts are more beloved to Allah than supererogatory ones, the most important thing for men is to pray both Isha and Fajr at the mosque. The scholars generally agreed that it is most likely to be in the last ten nights of Ramadan, with the odd nights being more likely, and the 27th night the most likely out of the odd nights. Imam Sarakhsi mentions in his Mabsut, that the position of most of the Companions (Allah be pleased with him) was that it is on the night of the 27th. This year 27th of Ramadan falls on Tuesday, 12th June 2018. There will be special activities at Shahjalal Mosque & Islamic Centre in the night before Tuesday including, Dhikr, Du’a, Talks etc. Both Iftar and Sehri will be provided at the Mosque. 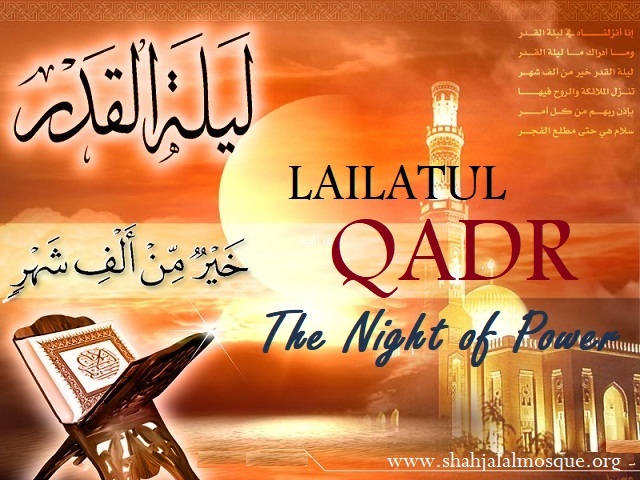 Sayyidatina Aisha , the mother of the believers and the beloved wife of the Prophet asked the Prophet (Sallallahu Alaihi Wa Sallam: O Messenger of Allah, if I witnessed the night of decree, Laylatul-qadr, then what du’a should I make?